Selena Gomez is following in the footsteps of stars like Taylor Swift, Katy Perry, Nicole “Snooki” Polizzi, and Sammi “Sweetheart” Giancola with her own perfume line! Selena created the scent with Givaudan. It has “top notes of orange, pineapple, peach and raspberry; a heart of purple freesia, Cosmone musk and dewberry, and a drydown of amber, vanilla, chocolate and coconut.” She looked to her fans for help on creating the perfume in the form of a contest. She picked her favorite ingredients and let fans vote, even flying groups of fans in to smell potential combinations. 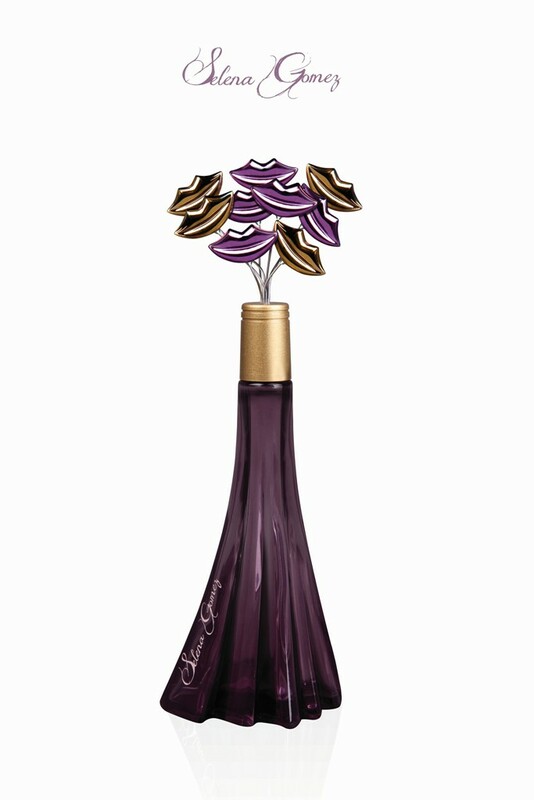 Gomez gave a look into her unique perfume bottle – a swirly purple gown topped with metallic lips, “I knew I wanted a tall bottle, because I feel like it can kind of stand up with all the other fragrances.” The ad for the perfume, which will be out in May and June books, was shot by Greg Kadel and features Selena, underwater, in a purple gown much like the perfume bottle. The fragrance can be bought exclusively at Macy’s and macys.com, beginning mid-May, and will be more widely distributed in August. The perfume will be available in two sizes, 1.7 oz. for $45 and 3.4 oz. for $55.